In June 1996, a new virus was discovered in Australia that later killed two humans. The virus was identified as a member of the lyssavirus group, and a close relative to classical rabies found overseas. 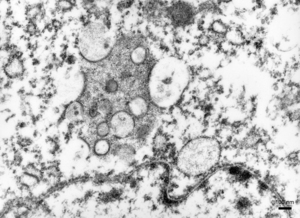 This transmission electron micrograph shows a section from a brain of a bat infected with Australian bat lyssavirus, at greater magnification than image GA1305. It shows an inclusion body that has been labeled with a monoclonal antibody which detects rabies and rabies related viral proteins. The antibodies have been labeled with colloidal gold.